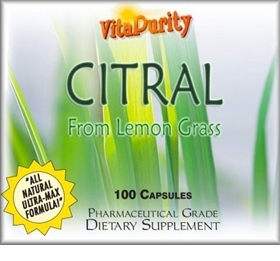 VitaPurity Citral from Lemon Grass matches the medical findings from Ben Gurion University in Israel. It contains the very same amount of Citral as in fresh Lemon Grass! It is recommended by doctors and physicians in Israel to treat patients suffering from cancer! New Israeli research showed that a drink with as little as one gram of lemon grass contains enough citral to prompt cancer cells to commit suicide. It all began when researchers at Ben Gurion University of the Negev discovered last year that the lemon aroma in herbs like lemon grass kills cancer cells in vitro, while leaving healthy cells unharmed. Citral is an antimicrobial and therefore effective in destroying or inhibiting microorganisms. Citral also contains antifungal properties, as this chemical has pheromonal qualities, which explains its industrial use as an insect repellant. It also has a positive effective on the body’s ability to use Vitamin A. Lemongrass contains the compounds myrcene, geraniol and nerol that contribute to it's strong fragrance. Lemongrass has rubefacient properties, meaning that it may be able to improve blood circulation. As an antifungal and antibacterial, Citral inhibits bacteria and yeast growth. It is useful for gastrointestinal infections and may also be applied externally to wounds as it fights germs. As an antioxidant, lemongrass contributes to liver and pancreatic health by helping the body to more quickly remove toxins. It has also being linked to lowering cholesterol levels, treating digestive issues including gastro-enteritis, and may be helpful in relieving constipation. Our exclusive formulation is GMP Certified and Pharmaceutical Grade so you know it's safe even in high doses.